There are different types of juicers and if you like juicing or want to get started then the choice of juicer is an important decision. 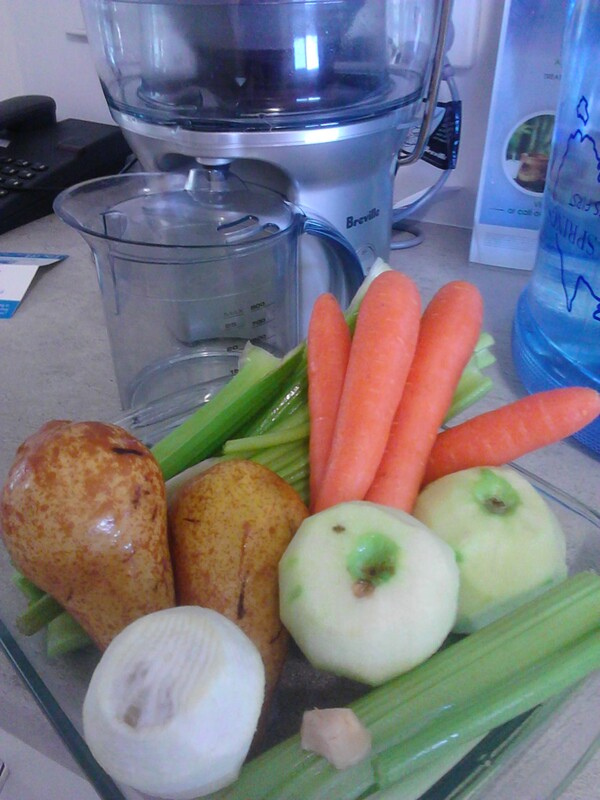 I really love juicing and have been doing it for a long time now. I was really amazed when l saw the movie ‘Fat, Sick and nearly Dead’ which got me even more excited about the health benefits of juicing. When l was really unwell last year having a juice each day was an important part of my diet as l couldn’t digest a smoothie or much else really so relied on my daily green juice to provide some really important nutrients. Now l have a few juices a week and alternate them with smoothies which l love also. There are many recipes in the media and diets that focus on juicing but you can’t get very far without a good juicing machine. You may already have a juicer or are thinking of buying one but it is important to do your research as there are heaps in the shops and the prices vary enormously. My First juicer was a Breville Juice Fountain Plus as featured in the movie l just mentioned. I really loved this juicer but found the noise of it really annoying (a bit like an aeroplane taking off). As with all juicers there is the need to wash the filter basket very carefully as you don’t want the little holes to become blocked or the efficiency of the machine will be reduced. A centrifugal juicer is very handy though as you can put whole pieces of fruit in it such as an apple and it removes the seeds and pulp. These types of juices are very quick to use but really shred the fruit and vegetables and create quite a lot of froth in the juice. When l became unwell last year l did a lot of research on juicers and decided l needed an Oscar Neo cold press juicer. 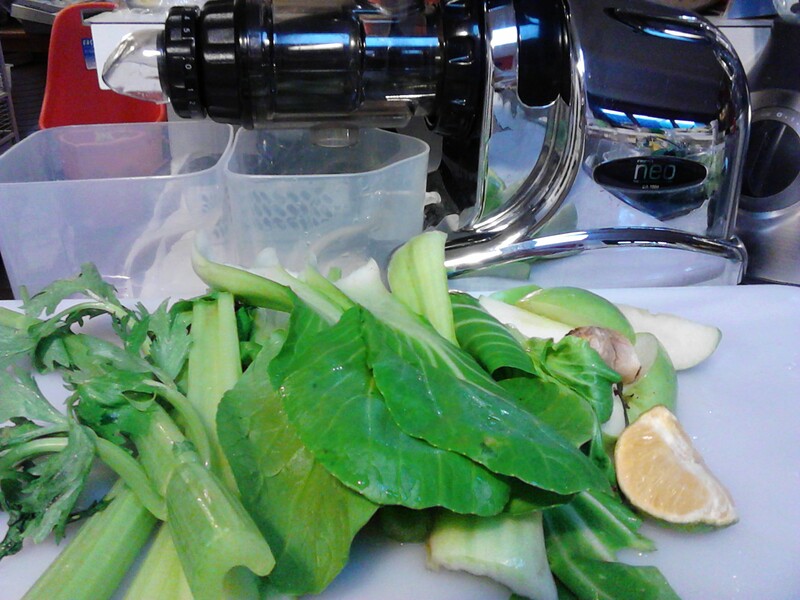 This juicer was under $400 and comes with a long warranty and is really an amazing machine. The juice it produces is very delicate and smooth and it is really wonderful to make green juices as it is gentle on the leaves such as spinach and kale. This type of juice is meant to have more enzymes in it and l found if l was feeling unwell in the afternoon that a green juice from my Oscar Neo would really pick me up as it was easily absorbed in to my body. The Oscar Neo can also be used to make nut butters and fruit sorbets. As my health improved and l was using the Oscar Neo less and less l found myself having more smoothies as they were quick to make and l could now digest them. Recently I decided to look around for an additional juicer that l could take on holidays and which would allow me to make some quick juices for the family which were not based on greens. I discovered that Breville now have a new simple juicer (pictured below) and this really suits my needs. I only paid around $100 as l bought it on sale and it is so light and portable that it easily packed in to the car on our recent holiday. I love that l can quickly put whole carrots, apples and pears in to it. The juice is very nice and l still have my Oscar Neo for the green juices when l want one. My new Breville Centrifugal Juicer- I love it. This one is a sensational colour. The Oscar Neo juicer-wonderful for green juices, nut butters and sorbets. 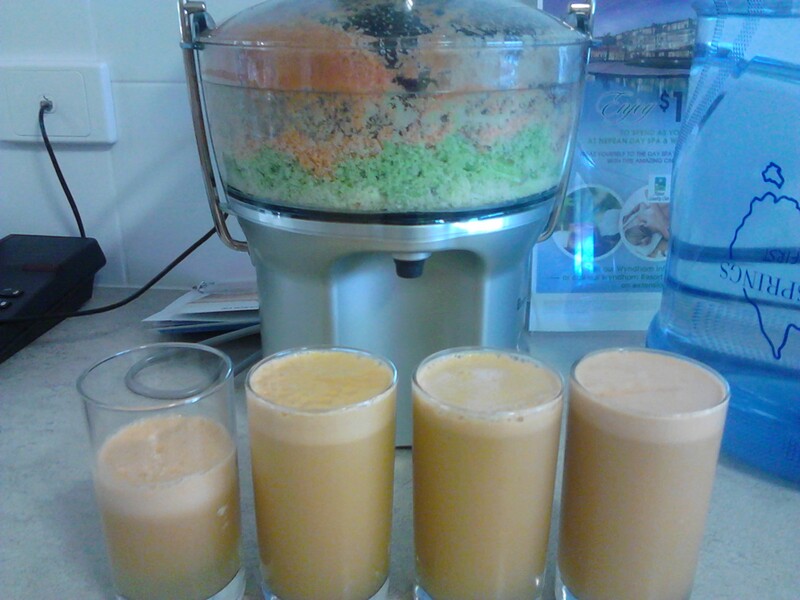 For general juicing (not greens) I think the juices taste similar from both types of machines. There is less froth in the Oscar Neo juice and more nutrients, but l like having both types of juicers as they work differently. There is a huge price difference and but if you are looking for a way to make very healing green juices then the cold pressed juicers are essential, but they are very expensive. A tip from me is to have the juicer proudly displayed on your bench top and I have all of my appliances on the bench even though my kitchen is not large. 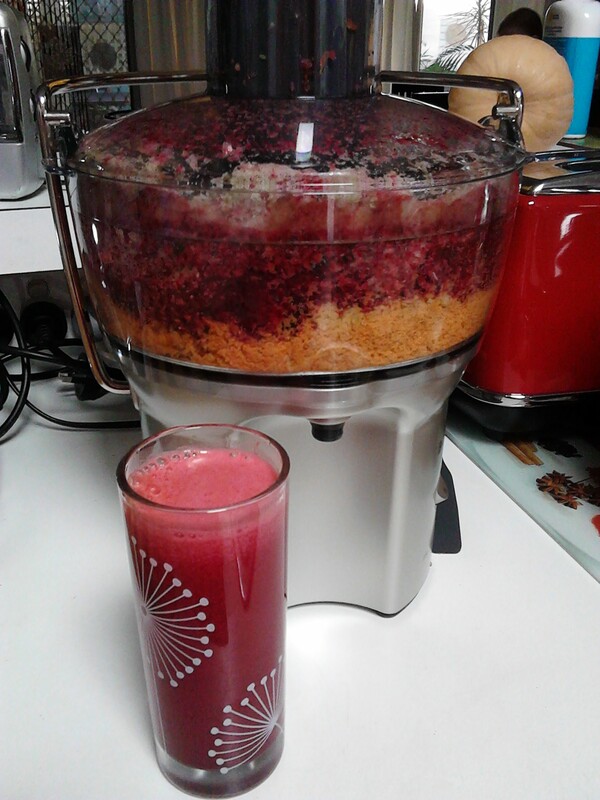 When l have my juicer in a cupboard l just don’t use it as the hassle of getting it out is a barrier, when there are already other barriers such as having the range of fresh fruit and vegetables in the fridge and preparing the ingredients to be juiced. The Oscar Neo is a stunning looking machine and appliances come in so many great colours now that you can have a theme throughout your kitchen with the appliances adding some real interest to the area. Don’t over do the juicing also. I think one juice a day is plenty as it is important to eat whole pieces of fruit and vegetables as these contain lots of really great fibre which is important for digestion and bowel health. I would have whole fruit, juices and smoothies as part of a healthy and balanced diet and make it fun by experimenting with lots of different ingredients. Use both fruits and vegetables in your juices and add ingredients such as ginger and herbs to add to the health benefits. 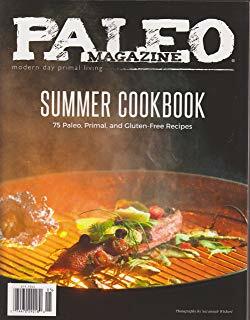 There are lots of websites with suggestions for juices to make, but your juicer will come with a recipe book that will give you some ideas and don’t forget that your own creativity and imagination is a great resource. Happy juicing!